In small-town modern day Nova Scotia Tara is getting to grips with living at her aunt and uncles house and returning to school after two years o home-schooling. Following a fire that burnt down the family home and her mum moving away following a better job, Tara is feeling lonely and unsure of what her life has become. Reminiscent of a time 150 years previous when her ancestor Josey has met Asa Curry, Josey doesn’t know that her world will be turned upside down by the arrival of this new man in town and she certainly doesn’t know that being swept off your feet is not always a good thing. Can Josey’s life experiences help Tara or has too much time passed? One thing that is guaranteed to get me out a reading slump is an incredible book and thankfully that is exactly what Mercury was for me. Mercury is a duel narrative graphic novel with historical and magical realism elements and it is begging to be read! The story was brilliant, I loved that the reader gets the story of both the girls and how different things impact them in different ways, Josey’s loss was Tara’s gain in so many ways and I loved that they were bound by family history and it wasn’t just something Tara came across from the towns history, it was her own. The Josey elements of the story were a little obvious as to where the story was going so I wasn’t shocked or surprised by any of it but I loved it all the same and think it would have been such an exciting time for her, especially as the idea of being presented as a debutante comes to her. For Tara things are a little worse of at the beginning of the story and its obvious her and her mom don’t agree on things. I liked that it felt like a real relationship and that Tara felt such a strong presence to French Hill. The characterisation was brilliant and I loved the emotions that managed to be portrayed through the illustrations. I laughed a little at Tara being mistaken for a boy and felt that it emphasised how ridiculous the idea of making that assumption on someone from the back because of their clothing and hair is and I liked how the subtle differences in the drawings made the reader aware of which character was which out of Tara and Ben. I also liked how the two main characters were drawn similarly so you could see a family connection too. The illustrations were amazing and its obvious that Hope Larson is very talented. It is the first full graphic novel I have read of hers and it will not be the last! The style is clear so its easy to read and even when similar the characters are easily identifiable. I loved the timeline right at the beginning of the book and think everything felt so much more exciting because of the way the stor was told using the two different perspectives from the character point of view and the illustrations themselves. 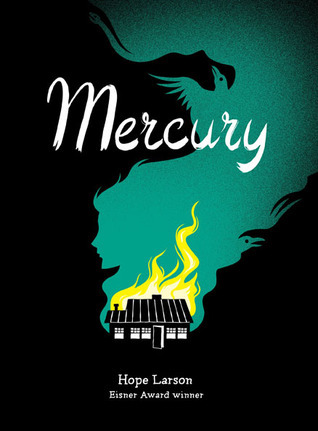 Mercury was published in the US in 2005 by Atheneum Books for Young Readers. My copy was purchased via the Amazon Marketplace as there is no UK publisher for the book.